Do you ever have a feeling that you are just the worst mother ever? Have you ever gone through something traumatic with your kids that still makes your heart ache at the thought of it as you still remember the details of that event? I’m sure every mom has a similar story that happened to her at least once in their mothering journey. 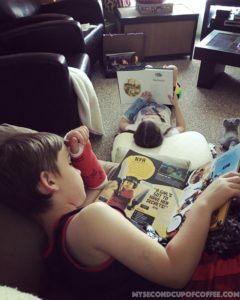 I had such an experience 2 summers ago when both of my kids broke their arms a week apart from each other. It was the beginning of June, and we had only 3 days left of school. Everyone was excited to switch to “vacation mode” and dive into all the fun that only summer time can offer. We had planned our outings, scheduled swim lessons, and our summer bucket list was almost ready to be hung on the wall. Nothing was foreshadowing that there could be trouble on the way. But that’s just how it happens in life, isn’t it? It was a beautiful warm evening, and my daughter was happily riding her scooter on the sidewalk right in front of our house. Suddenly, there is screaming and tears and chaos. She ran into the house holding her wrist saying she fell and that it hurt. Knowing my daughter who has earned herself a nickname of the biggest klutz ever known, we couldn’t quite determine whether it was serious or not. On some days, she is the grisliest of girls, and on others—she’s the Tomboy of the neighborhood. At any given time, she’s proudly wearing a few bruises and telling the story of each one to anyone who’d listen. So we did what we always do in these dramatic instances of her hurting herself: we applied ice and helped her calm down. Little did we know that our little girl actually did break a bone that evening. Ugh. What a trooper she was though. She had a decent sleep with little to none whimpering and only mild discomfort. I had actually sent her to school the next morning. My mother’s intuition was telling me to stop and ask more questions and to examine my little girl a little better, but the rush of the school morning got in the way, and so she got on the bus and went to school. And then my agony had began. I couldn’t sit still and kept thinking what if…she was really hurt and we were being negligent? What if she wasn’t completely honest about the pain level and was simply afraid to see the doctor? These “what ifs” kept racing through my head until I called the doctor and made an appointment to see her right after school. The doctor indeed confirmed my fear: “Your daughter has a broken arm”. I cried. So did my little girl. I felt like I failed her in a big way. I didn’t protect her, didn’t care properly for her, and I wasn’t a good parent to her. 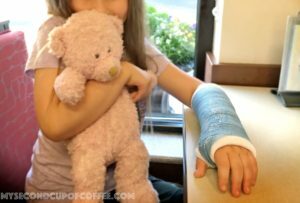 A mom sent her child to school with a broken arm, for crying out loud! But I also knew that my little girl was watching me and waiting for me to reassure, to calm her down, to help her process the same news I was having a hard time processing, and to help her look on the bright side. I had to pull myself together and in that moment just fake being upbeat and cool about the whole thing. Fake it till you make it, as the saying goes, and that’s exactly what I had to do in order to help us both. That day, my daughter got a beautiful sky blue cast, and we went to celebrate her bravery to Chick-fill-a. Slowly, we all got used to the idea of a cast, and that our summer vacation had started with an interesting twist. Honestly, it would have been a good enough story to stop right here, right? But, unfortunately, it continues. A week later, we were having a picnic with friends at the park. The kids were playing nicely on a playground, which, ironically, had that fancy soft rubber ground to ensure safe landings for little kids. We were enjoying the first summer week-end. School was out, and so were our worries and thoughts about grades and backpacks and homework. 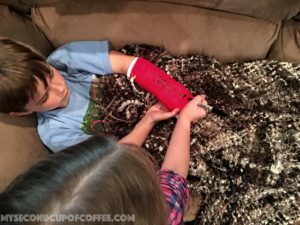 My daughter was dealing well with her cast, and we all seemed to be getting used to certain limitations because of it. You’d think I’m joking, but no–it was another broken arm!! And it was broken in exact same spot on the same left arm as my daughter’s. 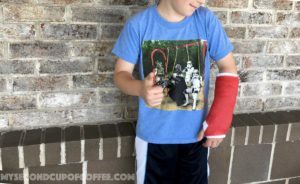 This time we rushed to the urgent care right away, and our fears were yet again confirmed– another buckle fracture, another cast…another failure. 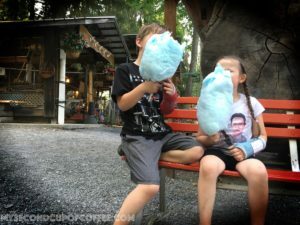 I have to admit, it took a lot of guts showing up places that summer with my kids, both sporting their casts, and catch various looks from people. I could sense their judgement and disapproval. Some, however, were very genuine in their curiosity of what had happened, and I truly appreciated their encouragement after they would hear our story. It would have been much easier to stay home for those 8 weeks and not do anything but watch TV and play video games. No people, no questions, no looks, no judgement. But at some point, you have to face the consequences and just be brave. Was it easy?? Of course, NOT! First, I had to forgive myself, again and again, day after day…I just couldn’t shake off this horrible feeling of guilt. It was tough. Seeing how uncomfortable the casts were, how cumbersome it had become to take showers, how the kids needed help with getting by in certain situations just kept reminding me that I didn’t do a good job protecting them. Every day, I had to tell myself that it was an accident (well, two freak accidents! ), and there was nothing I could have done to prevent them from happening except for maybe keeping my kids locked up at home on those two beautiful summer nights. With forgiveness, came acceptance of reality. And with that, came a question: so now what? The choice stared me in the face: I can either give in to the pity party, feel bad and miserable and beat myself up…or I can look for the opportunities to use this as life lessons and character building as much for the kids as it was for me. And so, by choosing the latter, we now look back at our Summer of Two Casts with a fond smile. It was by far, the most memorable summer to date. No, we don’t recall the misery of those nights when we had to take x-rays and be fitted for casts. The kids came in full uniform and sat on the sidelines with teammates watching and cheering on our teams. Did I tell you that both my daughter AND my son were playing soccer that summer? Yup, we would get dressed in full gear (uniforms, shin guards, cleats, and all), and we would be there on the field. Why? Because TEAM SPIRIT and SPORTSMANSHIP. I’ll be the first to admit, on some nights, I did not feel like going to a soccer game, especially that my kids weren’t playing. But I knew that this was a great opportunity to show them how to have good sportsmanship, how to be happy for another kid who scores all the goals instead of you, how to shake a hand after a game and congratulate the opponents on the win, even though you barely got off the grass. This was a tough lesson of sticking to your commitment, especially when you didn’t actually participate or contribute. 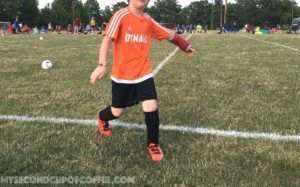 My daughter got to play the last game of the season, since her cast came off first. She scored her first and only goal in her soccer career that game! And she will always remember that goal and that she never gave up on the sport, even with a broken arm, and it actually paid off. -Changing the dates of our swim lessons, twice. First, because of my daughter’s arm. Second time—because of my son’s broken arm. It was so frustrating, I’ll admit. It was very hot out, and we could hear all the happy splashing and screaming from the neighborhood pool nearby. But it taught us all patience and perseverance. We knew our time would come, and it would be that much more enjoyable after waiting so long to finally be able to get into that water and have fun with friends. It also turned out that swimming was indeed a very good form of physical therapy for the kids’ healing arms, so it was a win-win! Thankfully, we did not need to cancel them entirely, but we had to make a few modifications. So it taught us flexibility. For example, we had planned a trip to the local amusement park, and guess what? We still went! There was still plenty to do besides crazy high roller coasters, and we had a super fun time, even with limited options. We did have to stop by the First Aid office to sign some liability forms and attach special tags attached to the casts. They conveniently indicated on which rides the kiddos were OK to go. 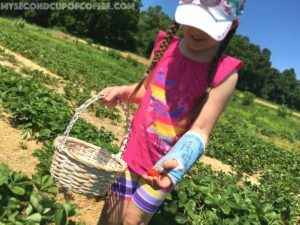 Our strawberry picking did not get affected at all. 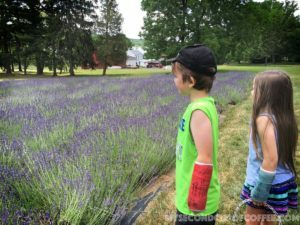 Annual Lavender farm outing went as well as we planned. 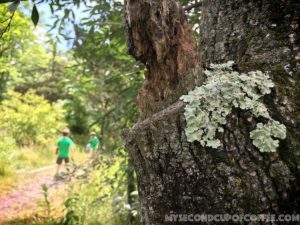 The nature hike on the lake was the highlight of July. And so many other day outings, they all went so well with little to no changes. As a mom, I had learned that there will surely be times when I mess up. I will miss the mark and make plenty of mistakes. I will have accidents. Surely, I will say something I don’t mean. There is a good chance I will not be fair. I will most certainly mess this parenting thing up many times over. But when I do make mistakes, I have to, I absolutely need to forgive myself first. I must allow grace to fill all the pores in my skin in order to move on and serve my kids and my family as best as I can. No human being is perfect. No mom out there is doing everything right. And I’m pretty sure no family in the world has it all together all the time. But we all have a chance to recognize our mistakes, learn from them, and move on. Through overcoming adversity that summer, we, as a family, had learned to enjoy life as it came. We lowered our expectations and learned to be content with what we had. It was nice to slow down, notice and enjoy the little things around us that bring simple joy. It was the Summer of Two Casts, the summer of small victories and big lessons. Strawberry Lemonade, a picnic favorite!